RapReviews.com Feature for August 4, 2009 - Gnawledge's "Granada Doaba"
Gnawledge Records has been making noise at RapReviews for a minute. Even though Mr. Hernandez knocked the label for their "corny name" reviewing Afro DZ ak's album yet he still got a 7 out of 10 across the board. Elemental Zazen fared even better with "The Glass Should Be Full" and got 8.5. Clearly there's something fresh going on in Bloomington, Indiana whether or not that's a city one traditionally thinks of as a hip-hop mecca. Perhaps "corn" is an apt term after all given it grows tall and strong in the midwest; after all, Rhymesayers Entertainment is based out of Minneapolis, Minnesota. Putting aside any preconceived notions of what a label based out of Indiana would sound like, these kids are fresh, and fresh is where you find it. We've heaped the praise on Gnawledge early in this review, so let's counter-balance it with the skepticism any critic would have reading the press sheet for "Granada Doaba." The opening paragraph sounds too good to be true. Aspiring artist Canyon Cody sends his demo tape TO THE UNITED STATES GOVERNMENT and gets a Fulbright scholarship in return. It gets better - Cody takes the money from his scholarship, moves to Spain with rapper/producer Gnotes, builds a recording studio above a guitar shop and starts recording with the locals. This is not a press sheet people, this is the rough draft for a movie to star Antonio Banderas that's directed by Quentin Tarantino. It's hard to argue with what one hears on "Granada Doaba" though, but it's worth noting this is far from a traditional hip-hop album. In fact listening to the opening track "Flamencologia" one could mistake this for a Paco de Lucía album. Ironically this is what one SHOULD expect from a team of rap producers living above a guitar shop in Spain - an album of hip-hop influenced flamenco guitar music. The word "influenced" is key because on many of these tracks, the hip-hop element isn't obvious sans the fact hip-hop artists produced it - they're just guitar instrumentals. On others it is much more clear, such as "Bohemia Al-Andalus," which matches the guitar playing with a rolling boom bap drum track and a snake charmer melody. The rest of "Granada Doaba" falls somewhere in between, from the low-key hand clap beat of "La Senda Del Abuelo" to the new age "Menudo Jaleo" that sounds like DJ QBert should be on it. In fact there is a turntablist who fades in and out, but I can't find credits for him and I wish he played a more prominent role. Despite the fact the Gnawledge people seem to be marketing this as a "world music" album as opposed to hip-hop per se, one can't help but hear the kind of old school drum beats looped in the heyday of the Furious Five lingering behind songs like "El Manisero De Potemkin," and the rolling jazzy bass that could be a Us3 track in "Calabazar De Sagua." If the music itself didn't prove out that these hip-hop producers influenced the sound they were capturing and recording in Granada, the bonus "remix" disc certainly does by matching all of these songs with rappers and singers joyfully flowing over these melodies, the best of which may be the Nona Kai remix of "Calabazar De Sagua," though I'm also partial to the Elemental Zazen take on "Nunca Fui a Granada." The latter is inspired by a Rafael Alberti poem, and the title loosely translates to "I Never Saw Granada," although you'll certainly feel like you've seen and felt what it's like to be there by the time you finish "Granada Doaba." This double disc set will leave your head swimming like a night spent in Madrid drinking too much wine and eating too much tapas. To be fair about it I can see how the skeptics on both sides will see it. One group will say "If I wanted to hear flamenco music I wouldn't buy a rap album" and the other will say "If I want to her underground rap I wouldn't buy an album of Spanish guitar." Okay - "Granada Doaba" is not for everyone - but if you're as open-minded and adventurous as Canyon Cody and Gnotes were in putting "Granada Doaba" together then you're in for a treat. I can't honestly rate the lyrical portion of this set given only the remixes have lyrics, and a lot of the lyrics aren't performed in english, so the ratings below reflect a different set of standards I think you will in the end agree with. One more thing readers of this review should know - each numbered copy of "Granada Doaba" comes with a message at the bottom saying "please copy, share and remix" so even though this initial pressing might be a limited edition of sorts there's no limit to how far and wide this music will spread. 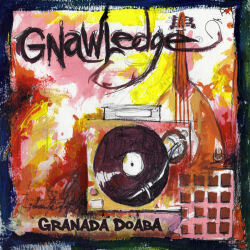 Don't be afraid to check out a download - that's what Gnawledge wants you to do, and "Granada Doaba" is certainly worth sharing.